Mix gelatin and sugar in a heavy sauce pan, then reserve. Whisk egg yolks and water together, then stir it into the reserved gelatin mixture. Cook over medium-low heat (do not boil), stirring constantly until gelatin and sugar dissolve (about 5 minutes). Remove from heat, and stir in pomegranate juice and lemon juice. Refrigerate pomegranate mixture, stirring occasionally, until the mixture mounds slightly when dropped from a spoon (about 2-1/2 hours). When the pomegranate mixture is ready, beat egg whites until stiff but not dry. Thoroughly fold the egg whites into the pomegranate mixture. Reserve. 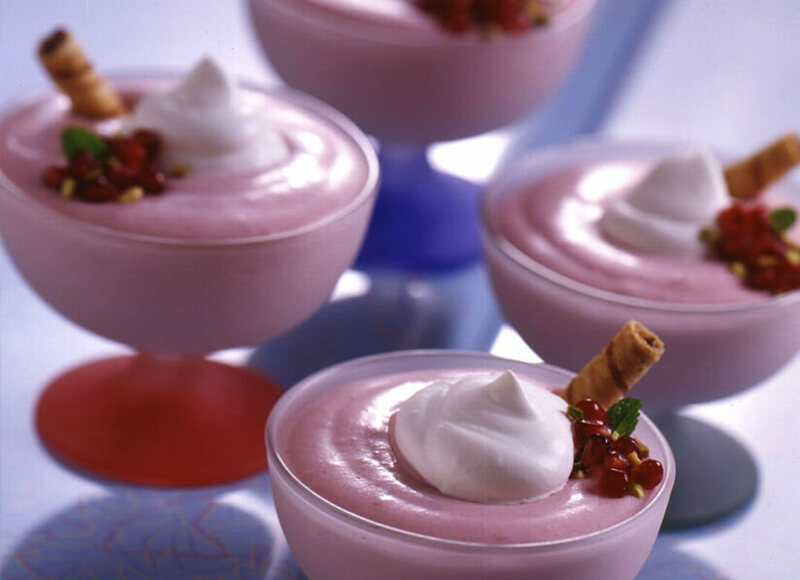 Beat cream until soft peaks form; thoroughly fold into pomegranate mixture. Divide mixture among six 8-ounce parfait glasses; chill at least 4 hours. To serve, garnish each parfait with a dollop of whipped cream; sprinkle each with some of the chopped pistachio nuts and pomegranate arils. Makes 6 servings. Freeze the filled glasses, before adding garnish. Use as a filling in a baked pie shell.